Welcome to the Party!!! 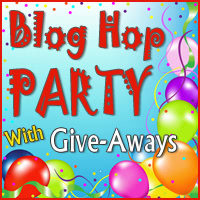 A big thanks to Michelle for hosting a Great Giveaway Party once again. It's just in time for the Holidays too! If you haven't been to my blog before I do hope that you will take a look around while you are here. You can find out more about me by looking at the Tabs at the top of the page and things that are in the Sidebar. The theme of the Party this time is Giving Thanks. I haven't been blogging regularly but about a year and a half and I am so thankful for all my readers and followers! It is amazing to me that my little blog is read by people around the world! It has been fun getting to know some of you better through your on blogs and comments on my posts. I hope to continue making NEW FRIENDS in the days to come. I have a Linky Party coming up in December. I ran one last year called The Christmas Stocking Hang Out and this year the focus will be on Christmas Tree Skirts. The Linky Party will be open the week before Christmas, December 17 - 24. If you have a Tree Skirt that you have made I do hope you will come back and join the fun! I have been looking for some Tree Skirt Tutorials to share that week too. If you have one or would like to post one please leave me a note in the comments. Now what am I giving away today? How about a couple of GREAT prizes! I have been enjoying watching ALEX and RICKY on The Quilt Show for a while now. I had watched all the FREE shows I could and then I won a membership last year. Boy do they have a Great Show! If you used to enjoy ALEX on the Simply Quilts on the HGTV channel you will love her and RICKY now! I'm giving away a 6 MONTH STAR Membership to the show. If you are already a STAR member I'm sorry but you can't win. This membership must go to a NEW member. (Sorry, not my rule). 1. Leave a comment below about what you think I should call my Christmas Tree Skirt Linky Party. I have a Poll in the Sidebar with a few suggestions but you can come up with something else. I have been trying to make up my mind about it for a few weeks and still am undecided. ALSO PLEASE let me know if you are already a STAR member of The Quilt Show. 2. My followers old or new can have a SECOND CHANCE to win. Just tell me how you follow me and what types of posts you enjoy the most. That's it! Be sure to check out the other blogs participating over at The Quilting Gallery! I voted for .....Round up. I have been following you via GFC. I appreciate all the SewWeQuilt hops you participate in. I love to see pictures. How about "Have you seen my Christmas skirt?" "Round Up" would be my vote! I follow you on Bloglovin and my favourite posts are all to do with demystifying techniques! I think the Round up would be a good name. Thanks for the great prizes. Tree Skirt Link Along is the only unimaginative name I could come up with!!! Skirting the tree! Thanks for the fun! I loved the eye candy on your "New Resources" post. I like roundup. That's what I call my weekly giveaway link up -- to which I've added yours! How about Quiltin' Around the Christmas Tree. Rather than rockin'. I follow via Bloglovin and am really new so still exploring your site. How about Santa's Landing Pad. I like lets skirt the tree. I have had a great time looking all around your blog and bookmarked it for later. I like the quotes, the tutorials, and always look to see if there are pics of a studio. Thanks for a fun trip! I'm a new blogger too, 6 months for me. I like Christmas Tree Skirt Round Up. Already a follower via Bloglovin. How about Christmas in Skirts? I'm sure you'll come up with something lovely. Thank you. I follow you via email. And, I am a Quilt Show Star member. How about Go Tell it 'Round the Tree (skirt)? I am an email follower. Thanks so much for sharing. I like Christmas Tree Skirt Link Up. Keeping it simple. Thanks for the opportunity. How about Skirt Chasers. Thanks for the chance to win. I voted for round up! I am a new follower by blog loving. How about the tree cutting party. I voted for Christmas tree skirt round up . Thanks for the chance , I am not a star member but would sure love to be . I follow you! How about Skirting Around For Christmas. I follow via email, thanks for the giveaway. The suggestions are so good. Round up sounds nice as well. What about Flirty Skirts for Christmas? Thanks for the lovely giveaway. I am an avid follower....enjoy reading and seeing the lovely pictures for inspiration. Thanks for the gorgeous second giveaway....that would be superb since the fabrics and T-shirt look absolutely adorable. Wishing you a great weekend. How about Skirting the Tree? Thanks for the chance at your giveaway. I would go with round up! I am an OLD follower! I love your great tips! I love the Christmas Tree Skirt Round Up option! Thanks for this great giveaway! I follow you via bloglovin- Thanks! Christmas Tree Skirt Round Up is very nice, I follow on Bloglovin. HI, HOW ABOUT "CHRISTMAS SKIRTS"! I guess I would call it Tree Skirt Link Up. I follow your blog via Bloglovin' - thanks!! I like Christmas Tree Skirt Round Up!!! I like Michele T's suggestion - Christmas Tree Skirt Round Up! How about Skirting the Tree? I follow with GFC and bloglovin. Thanks for a great giveaway. How about The Great Christmas Tree Cover Up? I like the Tree Skirt Show. I'm not a STAR member. Thanks for the great giveaway. I really like the Christmas Tree Skirt Roundup name. I 'm following through Bloglovin. I really like a variety of posts and don't have a favorite. I love this idea of the Christmas skirt, my favourite is Christmas Skirt Round up. I like the Round up:) I have only watched the free episodes myself, so this prize is awesome! I voted for round up because tree skirts tend to be round. I am not a Star member. I just started following your blog with feedly. I have not had a chance to explore enough to let you know what I like best, but I look forward to getting to know you better. The Round up one is fitting! I voted for Round Up! I'm not a star member. Looking forward to the tree skirt show. I would name it Santa's Gift mat's. I enjoy your hexi pictures and your free tutorials espically the baby blanket. Christmas Tree Skirt Layout. I am not a Star member so thank you for a chance to win this 6 month membership. I love watching the Free shows. "round about the christmas tree" for your linky .. amybe .. I don't know I'mnot good at making those thigns up ... can I want the fabric more than the star memebership? Skirt It Up Around the Tree!! Thanks for the giveaway!!! I like Skirt the Issue. Thanks for the chance to win! I voted for Round Up although my tree skirt is actually square (hmmm...). Love your blog and thanks for a wonderful giveaway! LOL, I like "Skirtin' the Tree" as a name. I think you should call it Christmas Party, Skirts Optional. I would love the videos. Thanks! I vote Roundup for a name. I follow you on bloglovin' and I think you should call your tree skirt party something like Firry Skirts or Piney Skirts. I am not a Star member of the Quilt Show. I like the boring tree skirt line up. Thanks for chance to win. My maiden name was Button, so that would be a fun prize to win. I'm a newbie.. my first Bog Hop! I am not a star member and would love to be chosen for either give-away. They both are great! I like the Christmas Tree Skirt Show name. I am not a Star member. I am not a Star member. I wanted to put the word "hem" in the tree skirt links name. You know hem of a skirt, and hem of your tree skirt,or border. But I couldn't come up with it. Sorry.